Gospelman the Strip - Jesus Saves! Comic 8 - Jesus Saves! It's another updated comic strip, fellow Gospel Chums! Not that it's been uploaded here before, but it has been on the other Gospelman websites and used as a front cover to the Free Series Preview printed issue! This image, more of a character pin up, was turned into one of the comic strips some time ago! It's kind of a "character bible" image for how I would continue to draw Gospelman from here on out! This design is used in the Gospelman Adventures series starting with the story, "The Cross of Grime Alley!" 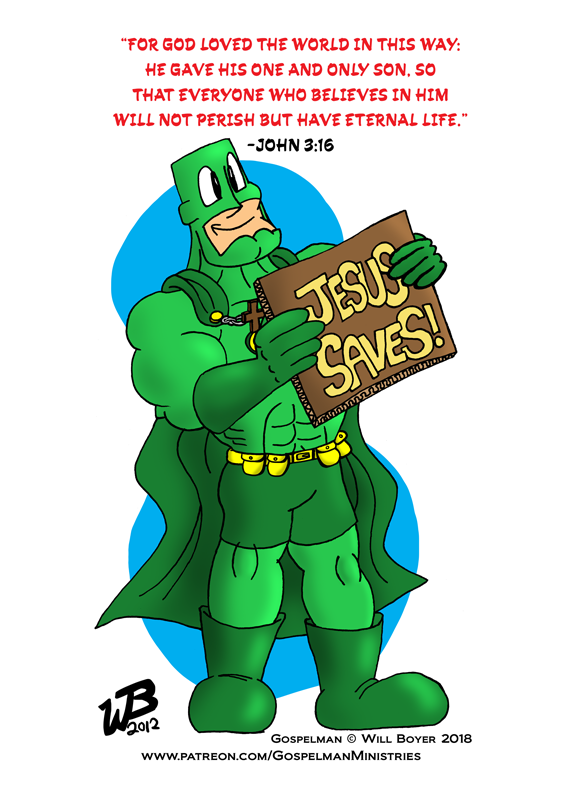 The art style is inspired by the art style of some superheroes featured on a children's Gospel tract - bonus points if you can find it!